Because this is so late, by now I'm sure your New Year's resolutions have already been set, so I guess maybe this can be used to help you refine them a little. I love to set goals. Randomly stop me on the street sometime and ask me what goals I am currently working towards and I will always be able to recite to you a current list because I always have a list! However, just because I am constantly working toward goals, doesn't mean I always accomplish them. A few months ago, after failing miserably trying to reach a certain goal I set for myself, I decided to do a little research on goal setting techniques (yes, I'm a nerd...but wait, you already knew that). :) I found a technique that, after trying several times, I've come to love because it totally works!!!! Since discovering this method, I have been able to achieve EVERY SINGLE goal I have set for myself using it. Hard to believe? Well, it's true and that's why you need to try it! Specific - A specific goal has a much greater chance of being accomplished than a general goal. EXAMPLE: A general goal would be, "Get in shape." But a specific goal would say, "Join a health club and workout 3 days a week." 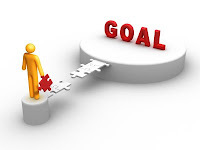 Measurable - Establish concrete criteria for measuring progress toward the attainment of each goal you set. When you measure your progress, you stay on track, reach your target dates, and experience the exhilaration of achievement that spurs you on to continued effort required to reach your goal. To determine if your goal is measurable, ask questions such as......How much? How many? How will I know when it is accomplished? Attainable - When you identify goals that are most important to you, you begin to figure out ways you can make them come true. You develop the attitudes, abilities, skills, and financial capacity to reach them. You begin seeing previously overlooked opportunities to bring yourself closer to the achievement of your goals. You can attain most any goal you set when you plan your steps wisely and establish a time frame that allows you to carry out those steps. Goals that may have seemed far away and out of reach eventually move closer and become attainable, not because your goals shrink, but because you grow and expand to match them. When you list your goals you build your self-image. You see yourself as worthy of these goals, and develop the traits and personality that allow you to possess them. Realistic - To be realistic, a goal must represent an objective toward which you are both willing and able to work. A goal can be both high and realistic; you are the only one who can decide just how high your goal should be. But be sure that every goal represents substantial progress. A high goal is frequently easier to reach than a low one because a low goal exerts low motivational force. Some of the hardest jobs you ever accomplished actually seem easy simply because they were a labor of love. Your goal is probably realistic if you truly believe that it can be accomplished. Last year I wrote down four new year's resolutions. I only accomplished one of them. The one I accomplished was to attend the temple at least once a month. I did it, sometimes on the last day of the month, but I did it and it felt so great!!! As I've looked back on the list of resolutions I made last year, I realized that the three goals I didn't accomplish were not set using the principles of this method and I'm certain that's why they weren't accomplished. But this year will be different!!! By the end of the year, I'm going to have four for four baby! So pull out your list of resolutions for the year, narrow the list down to 1-5 goals, set them using this method, and then watch the magic happen!